The Hitchhiker's Guide to the Galaxy is a wholly remarkable book. Perhaps the most remarkable, certainly the most successful book ever to come out of the great publishing corporations of Ursa Minor - of which no Earthman had ever heard of. More popular than The Celestial Home Care Omnibus, better selling than Fifty-three More Things to do in Zero Gravity, and more controversial than Oolon Colluphid's trilogy of philosophical blockbusters Where God Went Wrong, Some More of God's Greatest Mistakes and Who is this God Person Anyway? In many of the more relaxed civilizations on the Outer Eastern Rim of the Galaxy, the Hitch Hiker's Guide has already supplanted the great Encyclopedia Galactica as the standard repository of all knowledge and wisdom, for though it has many omissions and contains much that is apocryphal, or at least wildly inaccurate, it scores over the older, more pedestrian work in two important respects. First, it is slightly cheaper; and secondly it has the words DON'T PANIC inscribed in large friendly letters on its cover. Originally a radio comedy broadcast on BBC Radio 4 in 1978, it was later adapted to other formats, including stage shows, novels, comic book adaptations, a 1981 TV series, a 1984 computer game, and 2005 feature film. The Hitchhiker's Guide to the Galaxy has become an international multi-media phenomenon. The various versions follow the same basic plot but they are in many places mutually contradictory. This thread is for the book (we'll maybe have threads for the other formats later on). 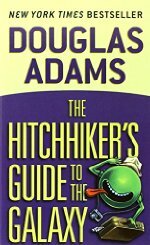 The different versions of the series spell the title differently−thus Hitch-Hiker's Guide, Hitch Hiker's Guide and Hitchhiker's Guide are used in different editions (US or UK), formats (audio or print) and compilations of the book. Some editions used different spellings on the spine and title page. Hitchhiker's is ultimately, the preferred spelling, despite what my spellchecker says. This is an eminently quotable book, and quite hilarious. However. Douglas Adams could not thread a plot to save his life. The original radio show was more or less written on the spot and very little beyond reshuffling and discarding some ideas and expanding on others was done to make this novel. His inability becomes more apparent in the later books, but is still apparent here where the story is a thinly linked series of scenes like a pearl necklace. This isn't a bad thing in itself (See Also: Monty Python) but I feel if he had collaborated with another author the original ideas could have anchored a more interesting storyline. Also, it'd be cool if Zaphod and Ford didn't have to share a personality and thematic role. Also, I take this opportunity to hype Dimension of Miracles which predates and predicts HHGTTG by over a decade. Douglas Adams never knew of it until years later and found the resemblance remarkable. I feel like Douglas Adams' story and world-building skill are pretty irrelevant to one's enjoyment of this book and the others afterward. Its charm derives almost entirely from his voice and commentary. If you like the way he thinks and you like the way he expresses his thoughts, the book is a ton of fun. If you are looking for a coherent alternate history of humanity in the universe, then this is not for you. It's little asides like the tangent about God disappearing in a puff of logic, or how Mark Knopfler can make a Schecter strat sing on a Saturday night or whatever other quirky things the narrator or the characters say. Likewise I'd strongly recommend that if you like Douglas Adams you should read PG Wodehouse ( who is not sci-fi, so we won't be covering in SSFF) who Adams said was amongst his major influences. The similarity in voice, is at times, striking. A Swedish friend posted a photo on Instagram of a novel they were reading, in Swedish. As soon as I saw a sentence with "[something something in Swedish] leopard" (which happens to be the same in both languages), I knew exactly what book it was. I have read it so many times, and admired Alan Rickman's Marvin in the recent film, I could almost quote it from start to finish. But I won't. Except to say that I never could get the hang of Thursdays. These books were such a huge part of my growing up, it's hard for me to be objective about them. Even as a kid I felt like the books went downhill, but now I wonder how much of that was Adams losing enthusiasm and how much was me growing up and having different sensibilities. I still love those first two books, but the others seem much more uneven. It's always broken my heart that Adams never got to write that last book. The way the series ends is so dark and hopeless, and Adams recognized that and was going to do a better send-off but then he up and died. Also, it'd be cool if Zaphod and Ford didn't have to share a personality and thematic role. "The ships hung in the air in much the same way that bricks don't." "No, it's just that the world's about to end." Six pints for five quid with enough left over for the barman to be very surprised by a "keep the change" tip dated very quickly. I still love those first two books, but the others seem much more uneven. It's the first two that I keep coming back to because yes, they're so joyfully voiced. The later books feel like more work to read, and I always assumed that was because they were more nose-to-the-grindstone work for Adams to write. Douglas Adams could not thread a plot to save his life. I feel like, especially in the first book, this is both true -- it's less a plot, more a ride past a number of funny vaguely-connected scenes -- and unimportant. It's so packed full of silly ideas and funny gags, and it has such a charming and consistent voice, that it gets away with it. Wait. It's not Ford and Arthur in the books too? I've read them so often and so much of their fandom that it has just blurred in my head that Ford is on earth simply because he developed an embarrassing fondness for Arthur, and I thought that was in the books too. There are certain compliments you can give a writer, and one of my highest is "this feels like Douglas Adams." Individual lines are very quotable and whole scenes are funny, but it hangs together on the tiniest most delicate absurd plot points, all held together by charm and curiousity. A glorious confection with such moments. I was given an omnibus edition of the books when I was a young teenager. I'd never heard of it, and nothing about the person who gave it to me inspired confidence that they'd choose something I'd like, so I left it on the shelf, unopened, for years. When I finally got around to opening the book and read the first few paragraphs, I knew I'd be a fan for life. But, I am intrigued by many of the comments here that rank the individual books very differently from my ordering. I've always found the first book and much of the second book less compelling than all the rest. (Well, maybe not Young Zaphod Plays it Safe.) If you re-read the first book too soon after finishing the series, it's hard not to feel a bit disappointed at its shortcomings. To be clear, I adore every version of the Guide, including the first books and the radio program. But, they don't really work as books. They're just a bunch of shaggy-dog stories strung together by a number of made up words that would be unbearable if penned by any other writer. Adams makes them bearable and worth bearing in order to get to the next golden sentence. But, the first two books can't compete with the the later ones which have actual plots and characters and, most importantly, center on ideas that become funnier the more you think about them. Vogon Poetry, The Answer, Milliways, and the Shoe Event Horizon are all fun. But as comedy goes, they're the verbal equivalent of vaudeville slapstick. They're shocking and it's impossible not to giggle the first time you encounter them. But, a minute later you discover that there isn't really anything there to think about. Someone devoted enormous resources to building a computer in order to answer a question they hadn't actually formulated, and it told them exactly how long it would take to answer it, and it was right, and then it told them exactly how to build a computer that would formulate their own original question, and then it was right again, but something went wrong, and so they just made up an answer instead. That's not a terribly profound parable, nor is it plausible even within the world of the novel. It is, of course, a beautiful excuse to imagine newly created whales and to talk about Fjords. It's worth reading repeatedly for those bits alone. By comparison, Agrajag, the Cricket Wars, the Total Perspective Vortex, the Somebody Else's Problem field, and the Grebulons remain funny and compelling every time you read them. They're anchored in a world that's internally consistent enough to accept and and similar enough to ours to be interesting. And they don't fall to pieces the moment you try to build head-canon around them. What's more, everything about the writing improves as the series matures: better dialogue, more interesting characters, fewer invented words. The later books are genuinely good novels, without sacrificing all the fantastic qualities of the first one. This first book was a fluke. Adams had no idea how to write a book, and broke pretty much every rule. It doesn't behave the way books normally do. The reason it ends in the middle of nowhere is that, with no time left if they were to make the publication date, his editor yanked the page he was working on from his typewriter and told him that he was done. That sort of thing normally doesn't work out. This was the one-in-a-million chance when it did, where every flaw worked in its favor, where every quirk and eccentricity added to the overall whole. It's a glorious exercise in the absurd. It was lightning in a bottle. It could never be replicated. I was going to go on to the rest of the series from there, but I think this isn't the thread for that. The Dirk Gently books are well-plotted, at least by comparison. And Mostly Harmless pretty much is Douglas Adams saying "Not only can I write a plot, I can write one that ensures that you can't ever make me write another sequel." I agree that Douglas Adams' use of language is what makes all of the books work, though. He could pretty much have written anything and I would have enjoyed reading it. My husband and I have "don't panic" engraved on the inside of our wedding rings. It's good advice for every occasion. I think it's this book that has the bit about hyperspace travel being like drinking a glass of water... from the perspective of the water. That still makes me laugh even after reading it a dozen times and thinking about it hundreds more. It took me 20 years to get that joke. I read the book when I was a child and assumed it was something to do with hangovers or something that I didn't understand, then one day I was arriving at work and I suddenly got it. The beauty really is in the setup, though, Arthur's initial misunderstanding. I just got that now too! I always thought it was a British way of saying, "You ask for a glass of water." It never occurred to me that he was saying, "Ask a glass of water." This thread reminds me that I've been meaning to convince my 9-year old to let me read this to him. Or to just read it himself, but I'd be so excited to read it to him even though it would take forever. Except that it would break my heart if he just sat there with that patient half-smile, like, "I don't really like this but I'm humoring my mother." It's so tough to know what kids will go for. You may want to start with the radio series. It could be something to listen to while you're driving somewhere. In my experience even kids who aren't into "old stuff" can get sucked into a good radio show. With a show like HHG2TG, the scene is so vivid you quickly forget there aren't any actual pictures. I believe this was the first sci-fi book I gave my son to read. He really liked it a lot. While the TV version is my favorite for the very sentimental reason of being my first introduction to Adams, I think the original radio version and (don't hate me) film adaptation are the best versions. mmoncur: "The Dirk Gently books are well-plotted, at least by comparison." Hmmm, I feel like Dirk Gently is just as terribly plotted, but in a completely different way. HHGG (and Restaurant, which feels to me very much like "here's the rest of HHGG, we just hadn't finished typing it up yet") is very much random things happening, that are *maybe* somehow vaguely related, but it's basically just skits strung together (the Python comparison made upthread is apposite). The Gently books, on the other hand, seem to have a real plot hiding in there somewhere, but Adams is incapable of actually clearly showing it to the reader. Every time I read them, I enjoy them, but I am left with a sense of, "Wait, now what was the whole thing with the alien and Coleridge again?" The Dirk Gently books were written quite differently. If I recall, he said that with Hitchhikers books he was always reaching for the joke and contorting plot around it, with Gently he was writing the book as a whole. We will get round to doing the TV shows, Films, Radio shows and other books in SSFF so do stay tuned for those. With Hitchhikers, he wasn't even writing a book, originally. Its genesis was as a radio series of six stand-alone episodes about the Earth being destroyed in a variety of ways. An overarching character of an alien observer working for a travel guide was added, only to eventually become the core concept of a more traditionally narrative series. I sort of think of Hitchhikers as being a kind of meta-textual agglomeration. The different versions and media all kind of superimpose and create a kind of palimpsesty gestalt where concepts like plot and narrative structure start to fall apart. I think Douglas would like that. I also loved the end of Mostly Harmless and am glad the series didn't continue. Well, that's what he felt when he wrote that book. But he did reconsider later, and was working on a sequel. The books are genuinely grim and despairing at times, but to me that ending was just TOO grim for the series. Adams grew to have some real hostility for the series, he got sick of it. That was how that ending read to me, like, "Screw this story, screw these characters and screw the fans! The end, the end, the end! Forever!" Later he calmed down and was going to have another crack at it... and then he up and died. I did feel like the books had been diminishing returns (which is not to say that they were actually bad) and it's not impossible the next book would have been a disappointment. But Adams felt he could have come up with a better finish, and I agree. The movie just made me angry. I don't know how much of Adams' work survived in that script, but it was the first iteration of the series that just did not feel like Adams at all to me. Huh. Really? One of the new bits felt very, very Adams to me - remember on the Vogon planet that there were those things in the ground that would pop up and slap you if you said anything at all about thinking, or opinions, or having ideas? Well - doesn't it make sense, from a layman's evolutionary-psychology perspective, that the beings on a planet with those things would evolve to become the very kind of total mindless bureaucrats that the Vogons are? Adams was just obsessed enough with the natural sciences that I would totally see him trying to come up with an environmental and evolutionary reason for the Vogons' mindlessness. Well, just as a for-instance, the whole thing with this swoony romance between Arthur and Trillian just seemed very Hollywood to me. Most of the great sequences and lines from the books/radio/TV version were dropped in favor of stuff that was nowhere near as good. I know Adams was kind of an idea machine and my understanding was that when he wrote the TV show he came up with all sorts of wild ideas that were tossed out. Stuff like the John Malkovich character and Marvin looking like a little robot baby, I could believe those ideas were Adams on an off day. And maybe the lame thing about Zaphod having his second head hidden in his neck was Adams too. (God, that was frustrating. We're finally at a point where they'd have the tech to give Zaphod a decent second head, and we get a damn goiter-face that we glimpse once or twice in the whole damn movie.) Maybe Adams was so sick of the material that he wanted a clean slate, but his new ideas weren't as good and then he died and the filmmakers were left with a lot of C-grade stuff he would have fixed if he'd lived. Or maybe he was heavily rewritten but he wasn't around to fight it. Whatever the hell happened, I spent the whole movie going, "Wait, you actually cut that... in favor of this?" The "So Long, and Thanks for All the Fish" opening number is all the justification the film needs. Utterly brilliant. I mean the issue of making a comedy movie out of material that is two generations old and roughly as loved as the Bible is sort of insane, especially when the slightest variation from The Joke will get you pilloried. I thought they did a good job, with some understandable nods to clichés of blockbuster filmmaking. I loved the books and radio show so much. The TV series mad me sad, I was 10 and just starting to understand the concept of TV/movies having "budgets". So I felt bad for the TV show, in addition to alienated by its specificity. By comparison the books and radio show seem to be free and limitless and full of joy. Still, the TV show's neon schematics do tend to pop up in my head a lot. I love the casting for the movie (minus Arthur), but I don't think the books really support the approach of just telling the events in a straightforward fashion minus all the commentary and digressions. Like... why would anyone think that was gonna work? I don't think it did work, either. The only bit of it I remember is the "don't think" face smacking scene, because it was unforgivably dumb.